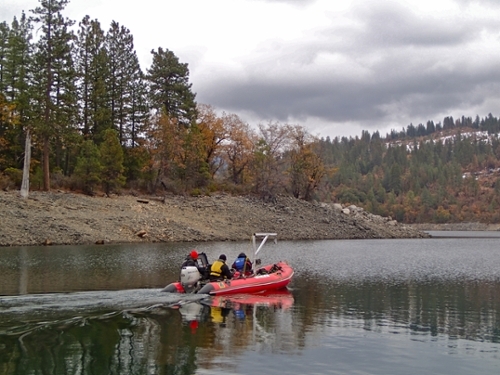 TERC research team heading out on Cherry Lake to sample water quality following the Rim Fire near Yosemite. On August 17, 2013 the largest recorded wildfire in the Sierra Nevada and the third largest in California history started in Stanislaus National Forest. This devastating fire burned more than 250,000 acres and took two months to contain. The effects of the fire on the terrestrial ecosystem will certainly last for years; here at TERC, the question is to what extent were Sierra lakes impacted? In October TERC researchers received a National Science Foundation - Rapid Response Grant to assess the effects of the Rim Fire on lakes in Northern California. It is a one year study to look at water quality and ecological changes in lakes affected by the wildfire. TERC is studying two lakes, Cherry Lake and Lake Eleanor, within the heart of the burn area and several lakes outside the immediate fire zone that were impacted by smoke during the fire event, including Lake Tahoe, Emerald Bay, and Cascade Lake. Rock Creek Lake just south of Mammoth will serve as the control lake since it was not impacted by the fire or smoke. UC Davis is participating in the study with Miami University, Ohio; Stoney Brook University, New York; University of Nevada, Reno; and UC Santa Barbara. Initial assessment of the water quality and zooplankton community was completed in late October, prior to significant rains. The science team will return following a weather event that causes dramatic runoff, or during the spring snowmelt. The research is focused on how the lakes respond to potentially large sediment loads brought about by runoff within watersheds stripped of vegetation by fire. The results will have importance to the Tahoe basin in understanding what might happen in the event of a local catastrophic wildfire. 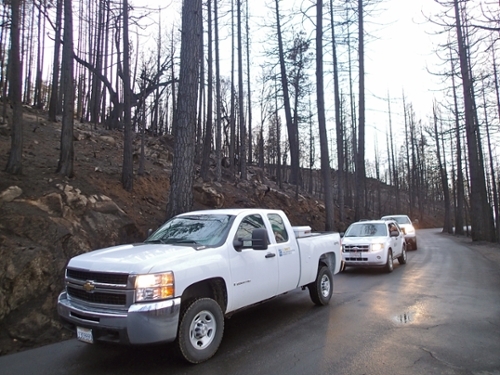 Burned trees, remnants from the Rim Fire, are evident behind the TERC truck.